The National Association of Latino Independent Producers (NALIP) held its sixth annual conference in Huntington Beach, California this past March. The conference brought together a record 600 attendees for three days of panel discussions in a friendly, nurturing environment that fostered networking, business and professional development. Several interesting themes emerged from the event, providing an opportunity for International Documentary to talk with panelists and attendees about the audience for Latino-themed documentaries and the concept of "Latino" filmmaking. NALIP was founded in 1999 as an emergency response to the Corporation for Public Broadcasting's (CPB) de-funding of the National Latino Communications Center (NLCC), which was responsible for dispersing CPB funds to Latino filmmakers. "What's so interesting about NALIP is that it was born from people in many areas of film, video, activism and academia, when we realized we were losing one of the few resources we had," explains NALIP founding member and Association of Independent Video and Filmmakers Executive Director Bienvenida Matias. The decision to de-fund the NLCC, which followed concerns about financial improprieties, galvanized filmmakers to come together to create a community of their own. Latino Public Broadcasting, currently led by Luca Bentivoglio, would later take the place of NLCC and has been instrumental in supporting NALIP's documentary makers. "Before NALIP we were a bunch of independent filmmakers working in our own spheres who didn't necessarily know each other," explains NALIP Board member and filmmaker Vangie Griego (God Willing). "NALIP created a sense of community." Matias adds, "All of a sudden we realized that our world was largerEast-West coast, doc-narrative. We created an organization that could be very inclusive of different ways to look at the world." 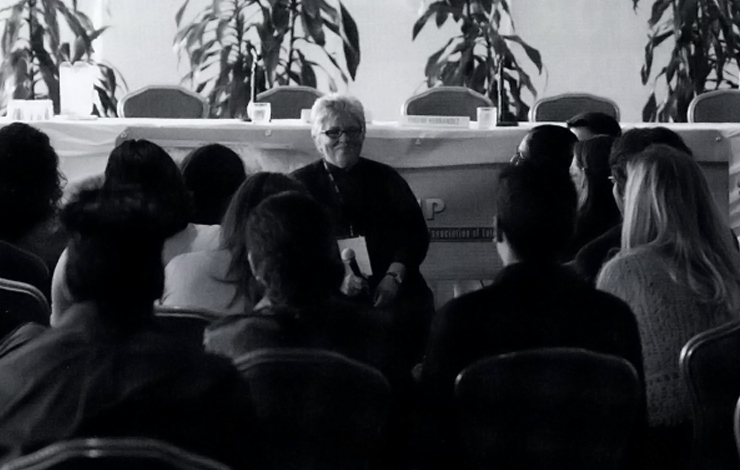 NALIP's early meetings included veteran filmmakers such as Moctezuma Esparza, Lourdes Portillo, Paul Espinosa and Hector Galán, but half of the attendees were under 35 and had different needs. "There was a charge in the air," Cristina Ibarra (The Last Conquistador) remembers. "We, the younger filmmakers, were especially frustrated because you need to be experienced before you can get funds from PBS. It was a double-edged swordhow do I get experience if I can't get my project made?" "A lot of focus was put on how to support not only the next generation but also mid-career filmmakers, to close the gap between younger and more senior makers," explains Kathryn Galán, NALIP's executive director. This focus on mentoring contributes to the spirit of the conference and to the excitement, learning and networking at the event. The panels at this year's conference, with titles such as "Documentary Clearances," "Hi-Def for Indies," "Documentary Trailer Evaluations" and "Budgeting Basics," attempted to bundle an entire doc education into a long weekend. NALIP founding member Ray Telles (Race Is the Place), who moderated the panel "Stories That Broke the Rules: Social Change Documentaries," explains, "We wanted to give filmmakers a true sense of what it takes to make a documentary--how much work it is, but also to encourage them not to give up." "I learned a great deal," says first-time attendee Gabriela Breton. "The doc panels were designed to fit any stage of production--from development to distribution. It gave me the big picture." But for Breton, who is developing the doc October 2nd, it was also an opportunity to participate in one of NALIP's newest programs: The Latino Media Market, which afforded filmmakers opportunities for one-on-one meetings with potential buyers, broadcasters and funders. "We wanted to turn the national conference into a business opportunity as well as a strong celebratory, informational and mentoring opportunity," Galán maintains. One of the most popular panels was "Pieces of the Doc Pie," moderated by Cara Mertes, executive director of the PBS series P.O.V. The panel, which brought together executives from LPB, PBS, CPB and ITVS, as well as from the Sundance Documentary Fund, focused on strategies for filmmakers to navigate the public television system. "I believe it is very important for public television to be represented at a conference like NALIP, which stresses a mix of commercial and non-commercial opportunities," says Mertes. "Commercial venues are good, but producers should be able to see the many options public television provides." The panel on "Press, Promotion and Outreach Plans" brought together journalists, publicists and community outreach specialists to discuss how best to reach audiences. Moderator Cynthia Lopez, vice president of P.O.V. and NALIP executive board member, explains the panel's three goals: "First was to hear from press people [about] what are the best ways to approach them so they consider covering us. Second, if you don't have a lot of resources, what are grassroots ways to promote your work? Third, how do we get our community to watch these non-traditional forms of media?" Publicist Lourdes Ortega emphasized the importance of "incorporating a publicist from the moment you conceive your doc. You must set your audience before you start making something." The panels led to much discussion about what makes a film "Latino" and the difficulties of defining the audience for "Latino-themed films." "There's the idea that only Latinos are going to watch Latino films, but these are good stories and if you market them properly people will watch," Telles pointed out. Sonya Childress, director of campaign strategies at Active Voice, a team of outreach specialists, talked about the outreach for the PBS series The New Americans, which tells the stories of recent immigrants to the United States: "We initially thought that the segment on the Flores family could speak to Latinos, but when we took the film to California's Central Valley, Latinos thought that although it validated their experiences, it didn't do much more for them. It was more interesting for them to hear about what other groups were going through." But, she continued, "The film was extremely effective in reaching longtime residents who might never have had a personal relationship with recent Latino immigrants." With an estimated population of 44 million, Latinos now account for nearly 14 percent of the total US population. But those numbers include foreign-born, second- and third-generation Americans alike, and different strategies are required to reach different segments of the Latino audience. As Debra Zimmerman, executive director of Women Make Movies, notes, "Cuban Americans are very different from Mexican-Americans, and very often you can't market a film just as 'Latino.'" "We find a great audience for our films," she maintains. "I think that Hollywood changes much more slowly than the rest of the country in terms of being able to identify who the audience really is. Señorita Extraviada [the director and producer of which, Lourdes Portillo, received the conference's Lifetime Achievement Award] has been consistently in the top five in Women Make Movies' collection." But while films are finding audiences, Zimmerman argues that there are still not enough Latina filmmakers producing strong documentaries today. "Funding is still not what it needs to be. It is still much easier to fund films about men than it is about women. I've seen many more doc features made by Latinas from Latin America than from the US." Sonia Gonzalez, who participated in the Latino Media Market with her doc Bragging Rights, believes that Latin American films have opened the doors for Latinos in the US, "But they represent the foreign experience. It is my goal to make Latino-themed films that are reflective of my experiences. As a little kid I looked for those images." "But as Latinos are looking for representation, there's no such thing as the 'right' Latino depiction," Gonzalez cautions. "I, for example, want to see more gay Latino-themed films that represent the homophobia encountered in our communities; that's brave." While some Latino producers choose to tell stories of living in the US as Latinos, subject matter can vary widely. "I think that it's important for Latino producers not to label or limit themselves," Gustavo Sagastume, PBS' vice president for programming, explains. "It starts with the filmmaker setting out a space in which to work that is not limited by ethnicity or origin." Matias cautions about prejudgments in either direction: "You also cannot be so narrowly focused to say that only Latinos can do films about Latinos; that's not the world we live in." Publicist Gabriel Reyes concludes, "When you get past labels and you start seeing the truth around things, your eyes open up, and that's the most wonderful service that docs can do for us: They open our eyes to the deeper truth about issues that we're more than likely misinformed about." This sense of enthusiasm is shared by participants in this year's conference. Sonya Childress was "inspired by the camaraderie and the youth and vitality of the people attending," and is eager to participate again. For Telles, "It's just such a rare opportunity to come together in a nurturing environment, in a setting that's unhurried. There's a feeling that we're not alone, that there's a space to share and help each other." For more information on NALIP visit www.nalip.org.